Alright guys, Bake #1 is in the books (or the blog, in this case). I'm going to try and be brief, but I'm also sharing a little note from my mom with photos of her bake, too! 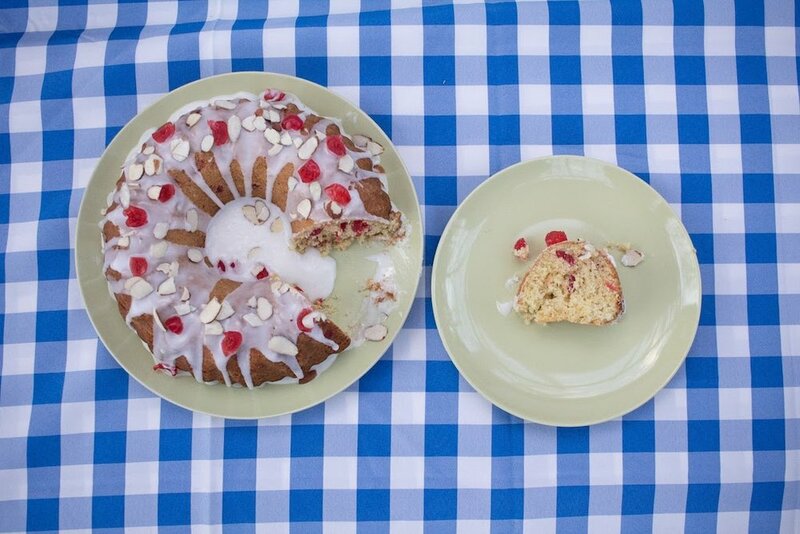 Mary Berry's cherry cake. 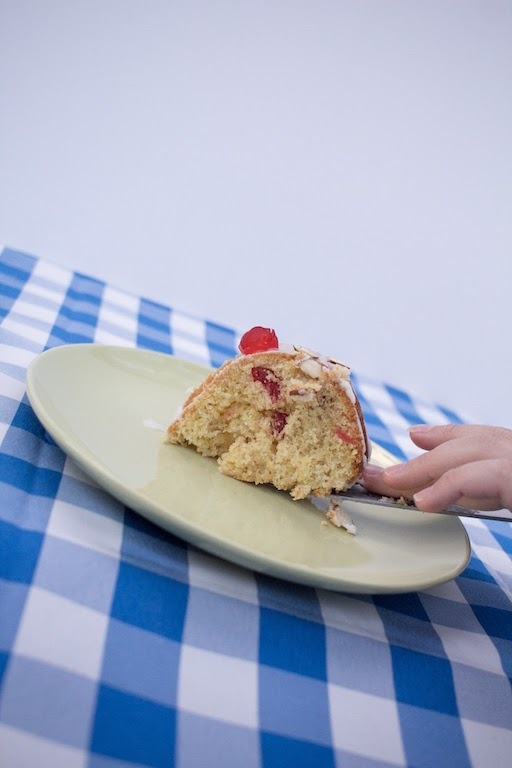 Make sure the cherries are evenly distributed throughout the cake, put your frosting on when the cake is completely cool so it doesn't run off the cake completely, and be sure it was a good bake and not over or under-done. This was fun! My mom would also attest to this, because we're both learning so much. Even as experienced bakers, we're running into challenges that make us question our skills a little, which is good! One of the major challenges I know I'm going to run into for all these bakes are the different ingredients. I did find caster sugar and glace cherries, but I made my own self-rising flour just hoping it was correct. The cake came out beautifully, but both mine and my mom's seemed dry. I baked it for the minimum amount of time, and it was quite crumbly. Perhaps it was supposed to be this way? The flavor was delicious, but neither of us would call it a "cherry cake" as the lemon seems to be the overarching flavor in this one. 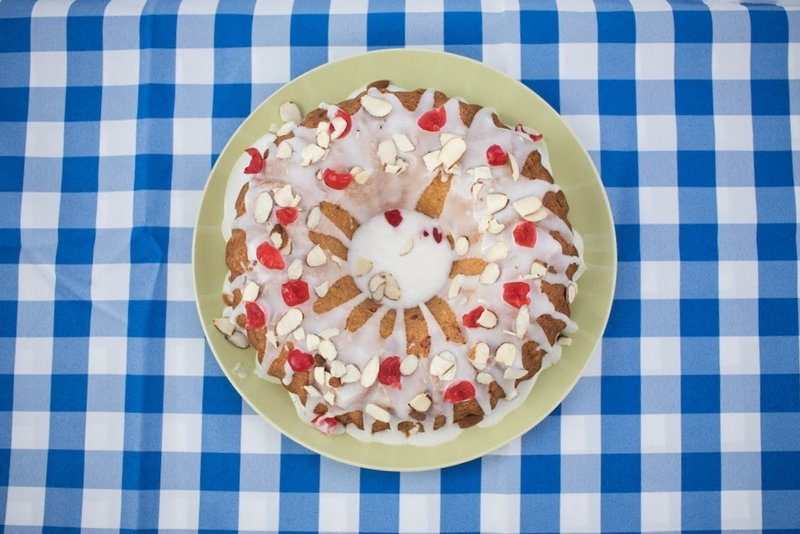 Has anyone else tried this cherry cake? Is it supposed to be dry? We thought maybe so, as a lot of European bakes are described as "crumb cakes." Nah. Good flavor, and lovely with a cup of coffee or tea, but not a favorite. See my big mistake? The cake was actually quite cool, but I think my frosting was a tad runny and it pooled all in the middle! Womp womp! Okay, so you ready to see my mom's version? Here's what she had to say, including some background about her, and our baking endeavors together. Make sure you read this because my mom is a hoot. "When Joy told me she was doing The Great British Baking Show on her blog I was immediately on board. My family has always told me that I should be in business because of my cooking. Well, that has not happened. Actually the thought of being successful makes me kind of tired. How on earth would I ever keep up if the demand for my products grew? (haha) In truth I really love cooking and baking for my family and friends, at a pace that I set. Another disadvantage I have is that I am a perfectionist and my standards are quite high. Everyone might be throughly enjoying something I have done and I am still disappointed with something (too dark around the edges, too runny, flavor is "off ", uneven layers, and so on). I learned to cook from my Mother and have great memories cooking and baking with my daughters. Even my boys can find their way around a kitchen. In fact each spring the men compete for the best rhubarb custard pie. The best thing about cooking and baking with your family is quite often the fun that ensues. This picture was taken after Joy and I got out of bed and started baking for an upcoming visit from her college friends. What a sweet memory of laughter and talking - the laughter is my favorite! Which leads to my assessment of our first challenge. 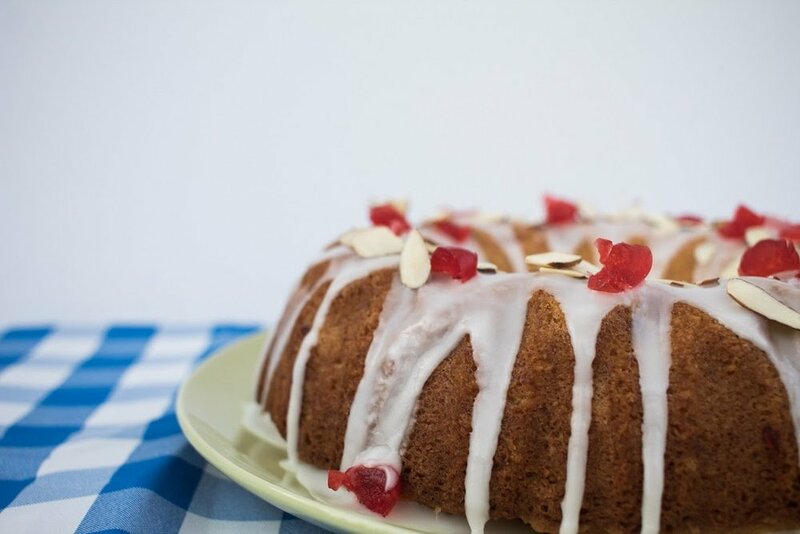 The cherry cake. I learned that 2 tsp. of baking powder to a cup of all purpose flour is a substitution for British self raising flour. I discovered in my small town that candied cherries are only available during the holidays. I was fortunate to find one tub of green. 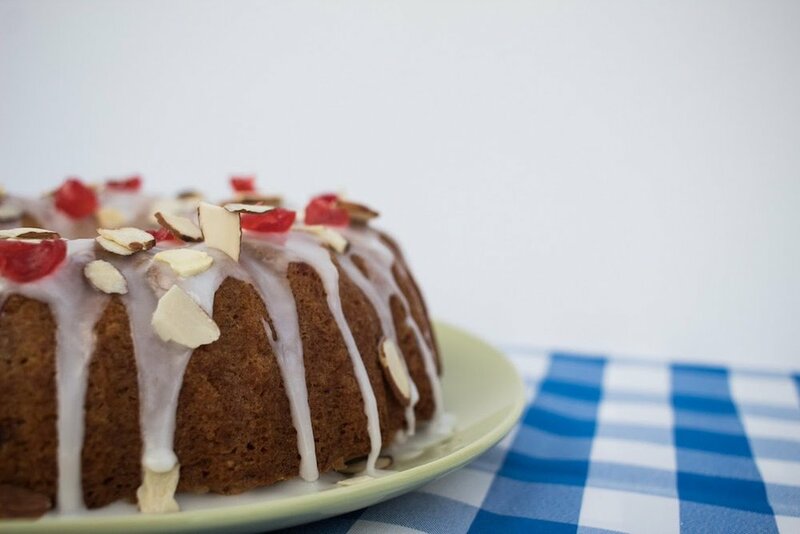 The cherry cake you see pictured would probably be made for a St. Patricks celebration. That is, if it would ever be made again. It went together pretty easily and the cherries did not sink to the bottom which was good. So on that score it was a success. My bundt pan was old and when I put the thick batter in, there was some trepidation about it coming out of the pan. Joy and I happened to be FaceTiming when the cake was ready to be turned out. We both wish we had videoed the moment for you.... only half of the cake came out! (Laughter ensued for a really long time) If you look very closely you will see a gouge toward the back of the cake. Thank goodness for frosting. The cake had very nice flavor and the tart lemon frosting was delicious, but the cake itself was DRY, DRY, DRY! 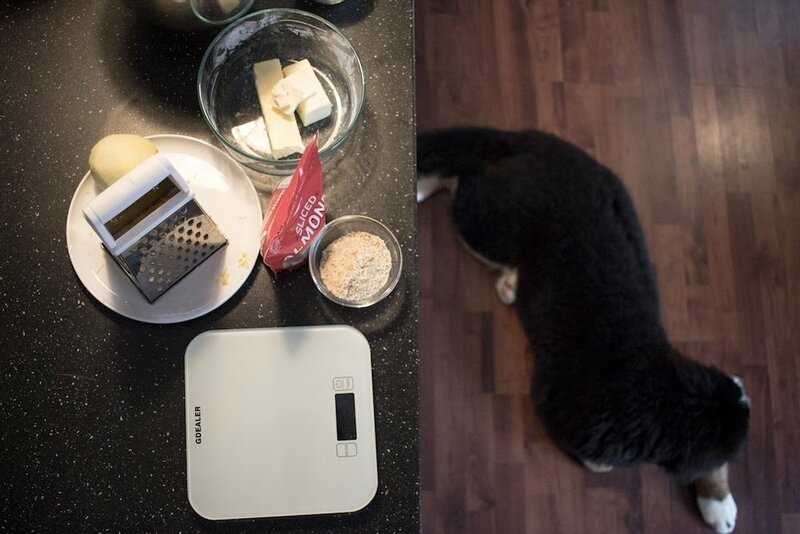 I won't have to make this cake again and couldn't really recommend it." So there you have it, friends! Bake #1 is done and we're ready to take on the next one! Are you joining us? Tag your photos #JoyLynnBakeAlong for a blog post feature.